I have a tradition of making Winter Solstice ornaments for our tree and for gifting, because they are hard to find in gift shops or online. In years past, I have made clay, quilted, embroidered and felted wool ornaments. I am making solar ornaments with Bee’s wax this year. Do you have Brown Bag clay cookie molds in the back of a drawer somewhere? You know, the ones you saved for making that cool homemade paper-craft project you have always meant to try? I did! Wax ornaments are my favorite way to use them now. Some of the molds are too large for ornaments, but others are just perfect. If you don’t have any, you can sometimes find them on the cheap at Antique stores. I have acquired several that way. I want to make a rubber mold of our Sol doorbell because it is the perfect size for a tree ornament. I could not locate any rubber mold making kits in our town, only acrylic clay mold material. It didn’t hold the pressed image well, or, I didn’t do it correctly. It lost some details when the clay relaxed. I have since learned Amazon has the rubber mold material, but I couldn’t get it delivered in time to use it for this article. To make wax ornaments in the clay cookie molds, first spray 2-3 clean molds lightly with vegetable spray. Arrange the molds on a cookie sheet lined with parchment or wax paper so you can reclaim any spilled wax. Melt about 1 to 1½ cups of bee’s wax to 60 degrees in a wax-melting pitcher (or other small, metal container) in a saucepan with 2 inches of simmering water. The metal container will allow the wax to stay fluid long enough to pour it into a few molds. Using a ladle will not work well. The edges cool so quickly that any pouring irregularities will be highly visible. Add one half teaspoon of Cassia essential oil to melted wax after it has cooled to 50 degrees. Pour into cavities immediately, slightly under-filling each mold. Tap the edge of the mold on the counter and release over a soft towel after they have cooled an hour or two. Most will pop out of the cookie molds very easily. If they don’t, refrigerate them for about 20 minutes and try again. To create a smooth hole for ribbon or string, heat the end of an ice pick or narrow paring knife over a stove burner or candle. Press lightly, and the hot metal will easily pierce through the wax to create a smooth hole in the ornament. If the edges are rough or irregular, heat the flat side of a butter knife and quickly smooth it over those areas of the ornament. We have just a couple of "deals" that are valid through the end of the year. #1 - all back issues are Buy 2, Get 1 FREE. This is an automatic discount, and no code is necessary. #2 - All purchases (US only) over $100 will be shipped FREE. 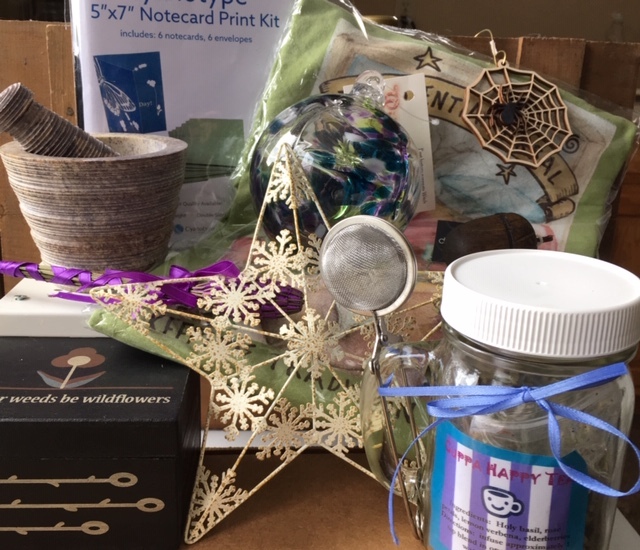 #3 - All boxed orders will get FREE gift, and I'll be trying to slip a little something in with envelopes of books, etc. There are some interesting new things on the site. 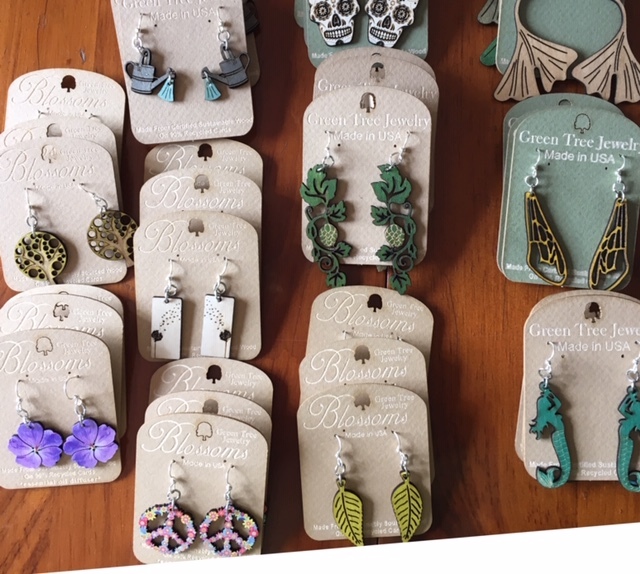 We got in 10 or 12 new lightweight earring styles. Beautiful and reasonably priced. They're all light as a feather. 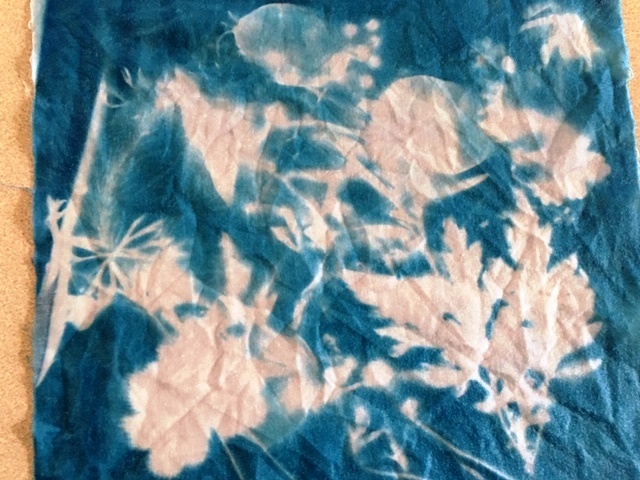 We got three different options for doing some for making Sun Prints. Packages of treated 8 x 8 inch cotton patches, notecard kits, and tshirts. Let your creativity go! This is my first attempt, playing around with it the other day. Yours would be much better, I'm sure. Gift Subscriptions - what a great way to give something special 6 times a year! We have both print and PDF available in the US, and PDF is available worldwide. For print, just provide your name and address in the billing section, and the recipient's info goes in the shipping section. Would you like us to include a message in the gift card? Just let us know in the comments section. For PDF, please provide the recipient's email address in the comments section. 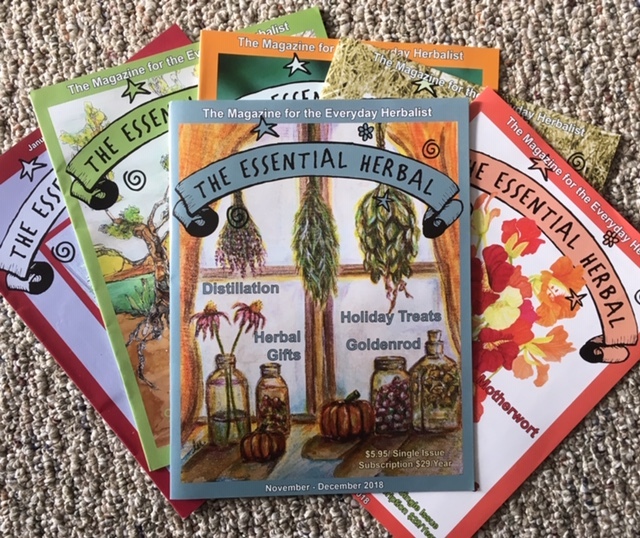 A very popular gift is the complete 10 Years of Herbal Knowledge in 3 volumes. Someday we'll try to put together the third 5 years, but for now, this is really a spectacular compilation. Beautiful and soft, the design uses 11 screen passes to capture the details - it's gorgeous! 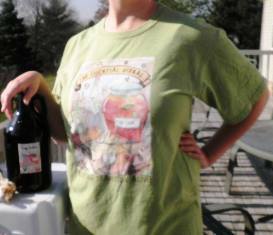 Fire cider t-shirts are also welcome, as well as soaps, teas, and remedies. 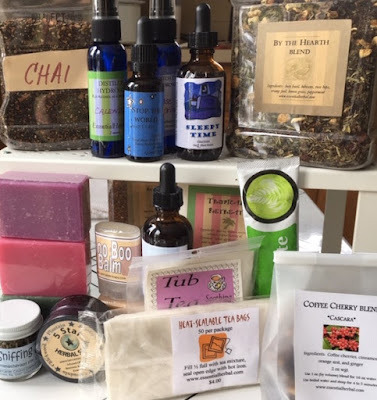 A large selection of teas, soaps, tinctures, hydrosols, and much more. Come take the website for a spin and you'll find gifts and stocking stuffers for everyone. Incenses and the ingredients to make your own, too! Rather than linking directly to each product, just come over to essentialherbal.com and look around. There's a lot more than you see here. As is often the case, we managed to slip a week of something intense into the schedule, with almost no visible disruption. 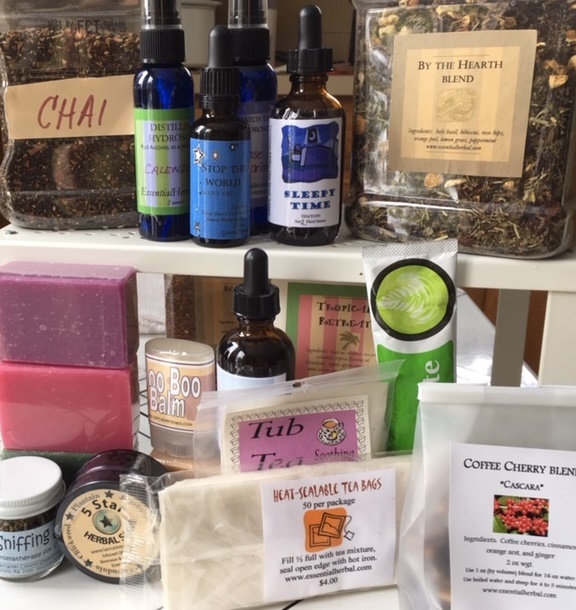 My sister stepped right up to the plate and covered for me on the magazine while also running her soap business and some other less pleasant responsibilities. I know that I am extremely lucky to be able to just relax. That is rare. I want to share how many different modalities were used together. In my mind, there is a place for all manner of healing, and they can help each other work better. One day a couple of weeks ago, I was working on the index for 2018 magazines (still need to work on that! ), and felt as if I'd pulled a muscle around the right, rear rib cage. Probably slouching in the desk chair. It didn't go away, and by the third night it hurt so badly that I couldn't sleep. Middle of the night Google had me on the phone first thing the next morning, sure that we were dealing with a ruptured gallbladder. That may sound alarmist, but I've (just barely) survived a ruptured organ in the past, and the pain was similar. The skin was becoming very tender along that side, but it was probably from my touching it, right? We get to the doctor, who does NOT mock me (much) for Googling in the middle of the night. She asks how long I've had this rash. WHAT??? 3 tiny little pinheads. Not even blistered yet. Once again, I am very fortunate. It is very early in the course of this outbreak, meaning that anti-viral medication will help shorten the duration and severity. I shudder to think how bad it could have been. She sends me on my way with a prescription for Valtrex and for 5% lidocaine patches with instructions to use tylenol as needed. The patches are denied by my insurance, so the pharmacist suggests Aspercreme 4% patches. Later insurance allowed the 5%, and that 1% made a huge difference. Still, the Aspercreme patches were better than nothing. When I got home, I posted on social media about it. My friends didn't let me down. 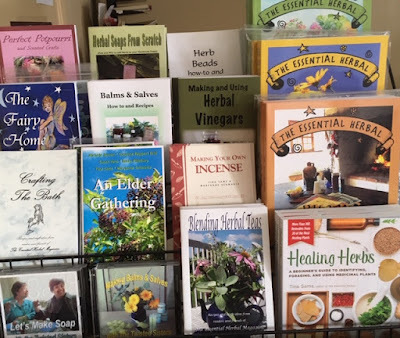 I'd already planned to get Ravensara essential oil blended in Calophyllum from Nature's Gift, and Marge mentioned that it could be overnighted. I foolishly passed on that, and wound up waiting a few days. In the meantime I put some lemon balm hydrosol in a spray bottle, and mixed St John's wort and Lemon Balm tincture in a dropper bottle. They were all very helpful. Sometimes just spraying the lemon balm hydrosol stopped the pain briefly. Maryanne bottled up some SJW infused oil for me. Several people mentioned Vitamin B-12 and L-Lysine. These both make perfect sense. A couple people recommended an antihistamine for sleep. Ah sleep, you elusive tease! Sleep was the hardest thing. I tried breathing exercises as well as Reiki, with moderate success, but it didn't allow sleep. My rash was around my waist on one side, spine to navel. It was impossible to get comfortable. The same was true during the day, but night time brought a sense of eternal dread. The doctor prescribed Gabapentin at a low dose. It made me sleep, but first I had to spend a couple of hours retching. NOTE: The first night, I'd also tried everything at once. Everything. At once. That meant that I didn't know what caused the retching. The next night I found out it was indeed the gabapentin, so no more of that. She then prescribed a low dose of elavil. That worked perfectly. Don't try everything at one time. Slowly but surely, the rash receded. It never got oozy or scabby. I believe that probably has a lot to do with the anti-viral medication, but the topicals were probably very valuable too. 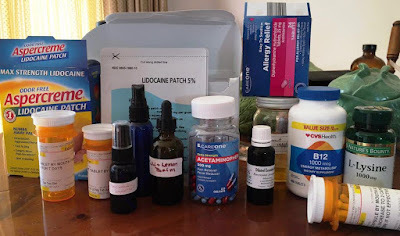 10 days in, I'm only using a patch and an elavil at night, and that's probably only because of a fear of pain, more than the reality. I hope this helps someone. As miserable as you might think this ailment is, it's much worse. I hesitated to write this up because I know many purists who shun OTC and pharmaceuticals. That's fine. 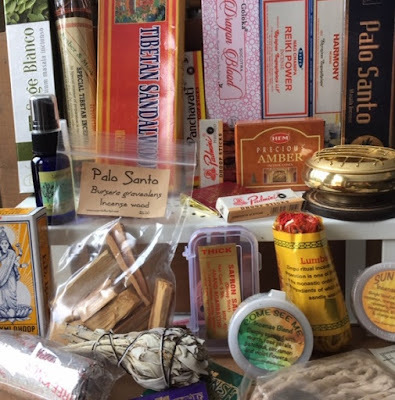 Generally speaking, I always reach for herbal and energetic medicines first, but there are times when we need to combine everything in the arsenol.